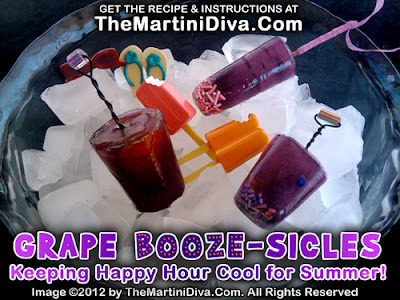 National Grape Popsicle Day is May 27th and I was asked to come up with a cocktail recipe for the occasion. Since it was already hitting summer temps across most of the country I decided to come up with an alcoholic grape popsicle instead. They are not only cooling during hot summer days but are a fun way to put some adult* fun in your next summer soiree. Note: You want the Champagne to be flat, especially if you are using regular popsicle molds because the bubbles (carbon dioxide) could blow the top off your popsicle while freezing. If you have the right popsicle molds and want to serve them in a glass, I suggest serving them in Champagne flutes then topping them off fresh, chilled Champagne. Add the sprinkles and fruits to the molds you're using. Combine the grape juice, Champagne and rose water then pour into the molds. To release dip mold quickly in warm water to release the popsicle. *I didn't have popsicle molds so I used fun shot glasses and jiggers and made some of my own popsicle sticks. To keep the sticks centered in the popsicle so I just cut a slit in a piece of cardboard, slid my one-of-a-kind popsicle "sticks" through and popped that into my makeshift popsicle cups. National Grape Popsicle Day is May 27th. * For the kids you can substitute flat grape soda or plain soda for the Champagne.